Stevens Furniture Restoration is happy to announce “The masterpiece art fair” perhaps the most prestigious summer collectibles fair to hit London. Showcasing a treasure trove of exceptional antique furniture and objet d’art. If you are interested in experiencing craftsmanship that is unparalleled and have a love for antique furniture Masterpiece Art Fair is for you, Other items which are on sale as well as antique furniture are modern designer furniture, modern art, rare wines and luxury watches. You will also find goods exhibited, ranging from Greek and Etruscan artefacts to Andy Warhol. This year the Masterpiece exhibition will be held from 27 June to 4 July at the Royal Hospital Chelsea and will host more than 150 international, world famous exhibitors. The list of participants is still being finalised: Stevens Furniture Restoration therefore recommends that you should keep yourselves up-to-date by consulting the official portal of the event exhibitors so as not to miss this summer appointment, also suitable for those seeking expert retailers of antique furniture restoration and valuable modern furniture repair. At Masterpiece London stands more like art exhibitions than sale’s spaces increase from year to year; veritable curators, for example, installed the exhibition in commemoration of Zaha Hadid, and the Belgium designer and antiques dealer Axel Vervoordt exhibited ancient Egyptian and Roman sculptures together with modern works of art and contemporary design. In short, you can find everything at Masterpiece Art Fair and the visual impact is unusual and considerable. HOW LONG HAS THE MASTERPIECE LONDON ART FAIR EXISTED? This year, the Masterpiece Art Fair is celebrating its eighth edition. Founded in 2010, is has made a name for itself as the most important summer event in the United Kingdom for those wishing to buy quality works of art. Around 40 thousand visitors every year travel to London to visit the Masterpiece exhibition recognising this fair as the most luxurious and sumptuous. Visitors include not only the curious, collectors and connoisseurs but also important people in the sector such as museum directors and specialists of important cultural events in the United Kingdom. In fact, Masterpiece Art Fair has developed from year to year, increasing its prestige and ranges from the art of Egyptian antiques to cutting edge design: with its exhibitors of rare objects and jewellery, and experts in period furniture restoration and innovators in the design field, it covers 5000 years of history. The great names of modern and mid Twentieth century design such as Jean Prouvéo Fredrikson Stallard are dedicated a considerable amount of space within the Masterpiece Art Fair and some works are created especially for the fair. The Based Upon studio, for example, has created a desk inspired by the cultural roots of the client and his early childhood in Siberia. In many cases some exhibitors even choose Masterpiece London Art Fair to make their debut in the sector, as happened for some Italians specialising in post-war Italian art. rare silverware exhibited by very famous galleries such as Adrian Sassoon, Steinitz, Röbbig München and Michele Beiny. [vc_row][vc_column][vc_column_text]One to put in the diary! STEVENS FURNITURE RESTORATION will be visiting Bada which starts from 14th -20th March 2018. The Bada (The British Antique Dealers’ Association) exhibition is held in London. An event annually visited by Stevens Furniture Restoration. This Fair is important for furniture enthusiasts and professionals involved in the trade and is particularly popular with those who appreciate the value of fine antique furniture and want to be kept up-to-date on what trends are emerging at the top end of the antique furniture world and also helps furniture restorers like ourselves. Stevens Furniture Restoration keep a keen look-out for events in the sector so that we can inform our client base and meet with other furniture restoration/dealer professionals. WHEN IS THE BADA FAIR IN LONDON? The twentieth edition of the Bada Fair – Fine Art, Design & Antiques was held in the pavilions of Duke of York Square in London, from 14 to 20 March 2018. Stevens Furniture Restoration announces this traditional antiques event not to be missed, promoted by the British Antique Dealers’ Association. An interesting appointment involving around 100 “professionals in the sector” i.e. experts in antique furniture restoration and furniture repair. Those taking part stand out for their internationally recognised experience, professionalism and expertise. The event includes other collateral attractions for antiques enthusiasts, such as the silver, ceramics and bronze exhibition from the Schrodere collection and the exhibition of military medals and decorations from the collections of Lord Ashcroft. Jonathan Cooper returned to the Bada Fair 2018 with a collective exhibition of exceptional British and international artists, including an exhibition of bronze sculptures by Tanya Brett. For more than 20 years the Bada Fair in London has been recognised as the major springtime event in the sector of antique furniture and furniture restoration. But Bada is also an important moment dedicated to the fine arts, design, exhibitions of rare objects and, naturally, a chance for the 100 participants selected from the most prestigious British antique dealers and furniture restorers to show off their wares. The quality and authenticity of each article on sale at the fair was carefully monitored by the control Committee in order to maintain the high standards of the Association. Collectors, furniture and interior design enthusiasts and furniture repair professionals meet every year at the Bada Fair to keep up-to-date about what’s new internationally and to enjoy so many unique opportunities to purchase exceptional items of traditional and modern art. In 2019, the Bada Fair will be held from 20 to 26 March, again in the pavilions of Duke of York Square. 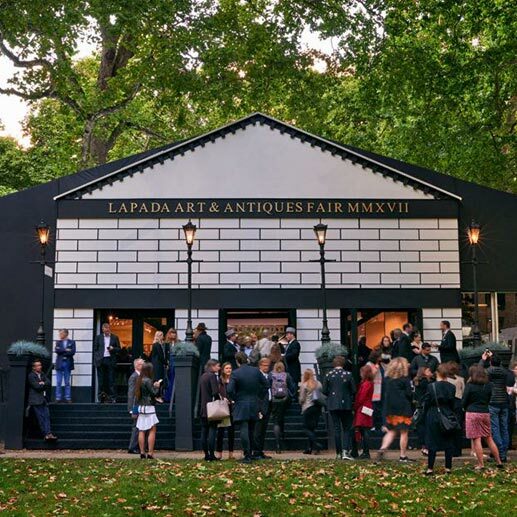 WHEN IS THE LAPADA ART AND ANTIQUES FAIR 2018? The International Lapada Art and Antiques Fair London is one of the major events in the English capital in terms of works of art, crafts, antiques and antique furniture restoration. This year the Lapada Art and Antiques Fair London will be held from 14 to19th September 2018 at the International Exhibition Centre, The Brewery, London. Stevens Furniture Restoration will be attending this event. If you are passionate about works of art and antique furniture or intrigued in the art of antique furniture restoration /furniture repair here is a fair which will inspire. With high end items of antique furniture and objet d’art. As always we at Stevens Furniture Restoration keep you up-to-date about the main events in this industries calendar, keeping yourselves informed about upcoming events, even if you are a furniture and design professional, meeting with other furniture repair professionals. A calendar follows of the exhibition, which will be divided into 7 days, so that you can organize yourselves. Please note that changes may be made to the days and times. WHAT WILL BE FOR SALE AT THE LAPADA ART AND ANTIQUES FAIR? exhibitors of works of art. The sale of reproductions of famous works of art is not allowed. A specialized committee assigned to checks, composed of 70 people including restorers of furniture and objects and specialists from auction houses esteemed for their expertise and integrity, guarantee the authenticity of the products and preselect them. Only members of Lapada can exhibit their own works and products on sale, after having accepted the Association’s code of conduct. The articles on sale at the Lapada Art and Antiques Fair have prices ranging from 500 to 500,000 pounds. This fair is not only an interesting opportunity for lovers of antiques and furniture restoration but in general attracts many curious people, even if they are not experts in the sector, as one of the most important social events in the English capital.